Jeb Nubey hides a secret about his past that has left him alienated from his family and hiding from the law. Against his better judgment, the Welbys, a trio of abandoned siblings, convince him to give them a ride into the town of Nazareth. But a storm and the loss of everything he owns forces Jeb and the Welby waifs to form an unlikely alliance, posing as a widowed preacher and his family. The oldest girl, Angel, thinks it's a match made in heaven. But Jeb is reliant on Angel to write his sermons, and the ruse of convincing the Church in the Dell congregation that they are legitimate threatens to unravel at any moment. Also unraveling are Jeb's feelings for the local school teacher, Fern Coulter, in this extraordinary tale of redemption. 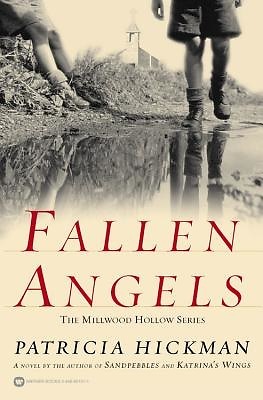 FALLEN ANGELS launches the Millwood Hollow series, featuring Jeb Nubey and the inescapable Welbys as they come of age during America's turbulent years. Patricia Hickman's most recent novel, Sandpebbles, was published as a paperback original by the W Publishing Group in 2/02 and has 50,000 copies in print. It was featured at the 2002 Women of Faith conferences, where Hickman made numerous guest appearances. Katrina's Wings (WaterBrook, 5/00) received rave reviews and was selected as a Romantic Times Top Pick. Hickman has been hailed by such authors as Patsy Clairmont, Francine Rivers, Karen Kingsbury, and Robin Lee Hatcher as the new and lyrical voice of the South. Patricia Hickman is an award-winning novelist, a part-time speaker, a wife, and a mother. Her writings have received critical acclaim and earned her multiple awards, including two Silver Angel Awards.